WEST LAFAYETTE, Indiana, November 3, 2011 (ENS) – An ant species common to the mainland United States that is known for its tropical smell has invaded Hawaii for the first time. 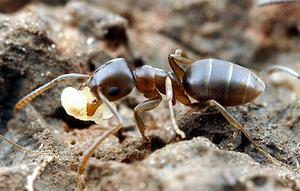 A population of odorous house ants, Tapinoma sessile, has been found at an upland site on the island of Maui. Also called stink ant, and coconut ant, these ants got their names because they invade houses and smell like coconut when smashed. Purdue University entomologist Grzegorz Buczkowski says the Maui invasion is the first confirmed record for this species outside its native North American range. “We went there to eliminate the ants, but we found it’s too late to treat for them,” he said. On Maui, the ants are on the western slopes of the Haleakala volcano among some small farms. Buczkowski said the Maui invasion is a single supercolony with more than 300 nests and multiple queens per nest covering more than 45 acres. It’s likely that the odorous house ants stowed away on a ship that docked in Hawaii, guesses Buczkowski, who said he is stunned that they made such a long journey from their native area. In the continental United States, odorous house ants are difficult to remove, Buczkowski said. A nest might be eliminated at one house, but other nests could be in nearby yards, allowing the ants to return. “It’s one of the worst, if not the worst, pest species in homes,” Buczkowski said. The U.S. Department of Agriculture’s National Institute of Food and Agriculture and DuPont funded Buczkowski’s research. The entomologist said it is too soon to know what the effect of odorous house ants will be on Hawaii’s native plant and animal species, but he wants to monitor the ecosystem around their nests. He is concerned about how the ants might react to Hawaii’s climate. On the mainland, odorous house ants go dormant in winter, but with Hawaii’s favorable year-round temperatures, the ants could continue to eat and expand much faster than in their native range. In natural settings, odorous house ants live about 50 to a colony with one queen, often taking up residence in acorns or other small spaces. 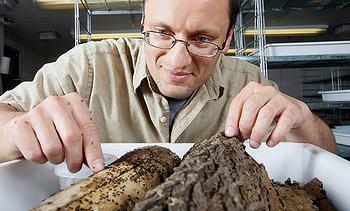 But Buczkowski’s previous research has shown that when odorous house ants move into urban areas, colony sizes explode. On the Purdue campus, for example, Buczkowski has found a colony with five million worker ants and about 25,000 queens. On Maui, the odorous house ants are thriving among several other ant species, such as invasive Argentine ants and big-headed ants, which are aggressive toward other ant species. Hawaii is one of the few places on Earth that has no native ant species due to the isolation of the island chain. But today, at least 57 ant species have invaded the islands and become established.